Scientists have identified “Blue Zones” around the world. These are areas where men and women live well into the 90’s and beyond. They live healthy and strong. 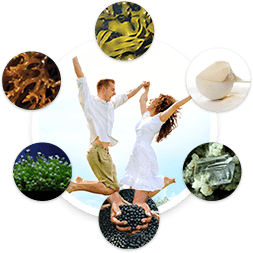 Their diets are often similar and include elements such as Laminaria Japonica, Fucoidan, and Fucoxanthin.Health research has shown the value of these substances to support the body’s own ability to maintain heart health, joint health, digestive function, and support health blood pressure levels. 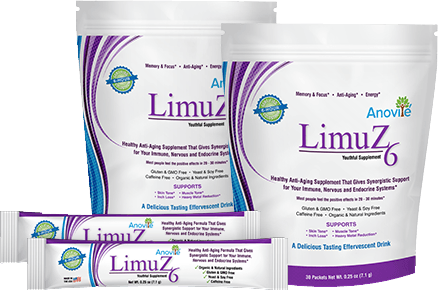 LimuZ6 was created based on what we have learned from those in the blue zones. 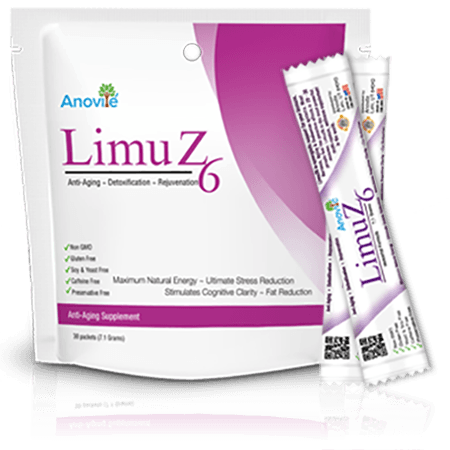 LimuZ6 utilizes Anovite’s cornerstone product Colostrum6 in an effervescent and isotonic powder to increase negative ion’s and balance your pH. A high proportion of negative ions around us will make us feel lively, fit and enthusiastic. On the other hand, too many positive ions will cause aches and pains associated with the aging process. It is the negative ions (alkaline) that are beneficial to both the body and the brain… found abundantly in LimuZ6. The less liquid you use when mixing LimuZ6, the more concentrated it is and the more powerful it becomes. General Dosage: Try using one (1) in the morning for energy and focus and one (1) in the evening 1/2 hour before bed to help you sleep like a baby! Also called antibodies, neutralize pathogens in the lymphatic and circulatory systems. A small hormone-like protein that can suppress appetite and lead to body weight reduction. 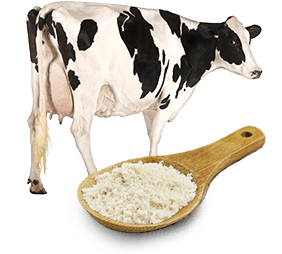 Composed of two protein-based chains, known as alpha or beta chains, which are separately present in bovine colostrum. The chains act on the thymus gland independently or stimulate activation, development and maintenance of the immune system. Also known as “permeability factor,” are actually small proteins that slow down or inhibit the enzymatic breakdown of proteins. They provide protection to the immune, growth and metabolic factors as they pass through the digestive tract. Helps regulate the immune system, keeping it in balance between under and over-activity this can be extremely beneficial for those with Autoimmune diseases. Colostrum6 is Anovite’s cornerstone product because it contains over 700+ components – ranging from the all-natural “Whole Food IGF-1 Super Anti-Aging Family,” to the more than 100+ different immune factors; Therefore, it has an impact on every cell and system within the body. 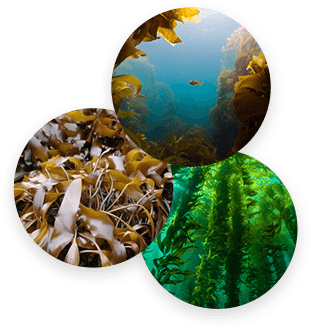 There are 70+ vital nutrients found in Laminaria Japonica, Fucoidan and Fucoxanthin – including immune-supporting antioxidants, polyphenols, amino acids, glyconutrients, vitamins, minerals, and more. These substances support healthy gut and digestion function, help support health blood pressure levels and address other unbalanced chemical issues in the body. 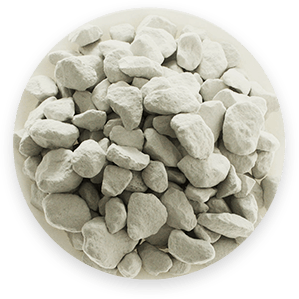 Clinoptilolite has very unique honeycomb-like cellular structures with the ability to trap and then bind with various toxins, heavy metals, viral particles, as well as other impurities and remove them safely from your body. 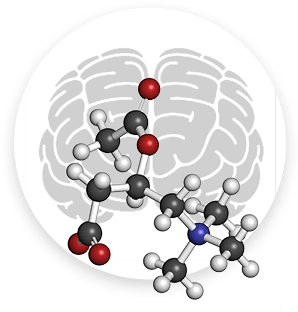 An amino acid that occurs naturally in the brain. As we age natural levels of this vital amino acid diminish and we may experience a breakdown of cognitive function. Research has shown that Acetyl-L-Carnitine has a profoundly positive impact on many different areas of the body including heart health, needed weight loss or weight gain and help with memory and cognition issues. 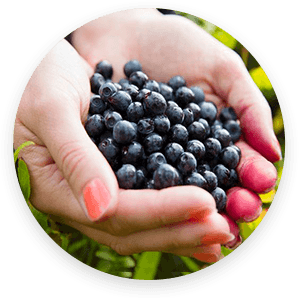 Acai Berry contains antioxidants, fiber, and heart-healthy fats that promote protection for cells from damage caused by harmful molecules in the body called “free radicals.” Acai berries are well known to help promote the body’s immune function.